If you can recharge at home and/or at work, consider the 2016 Ford C-Max Energi plug-in hybrid, which qualifies for a substantial federal income-tax credit that will offset some of its higher cost. The 2016 Ford C-Max Hybrid and C-Max Energi offer a sportier alternative to the Toyota Prius range that feels premium inside and more capable on the road. 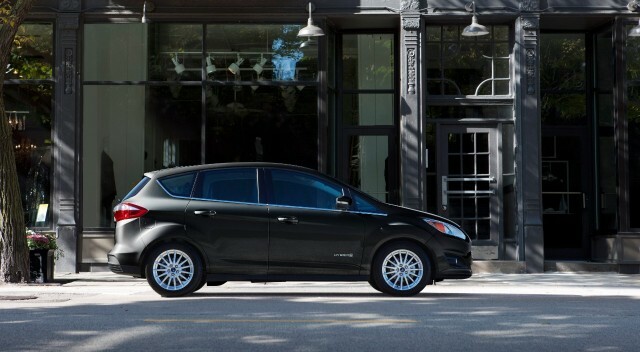 Now in their fourth model year without significant changes, the 2016 Ford C-Max Hybrid and plug-in hybrid Energi model are dedicated hybrids—meaning they have no gasoline-only versions. 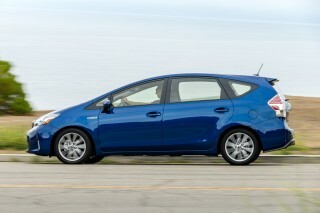 That makes the C-Max compact hatchback a direct competitor to the Toyota Prius liftback and Prius V wagon. For 2016, the sole changes to the C-Max line are two new colors and the addition of the new Sync 3 voice-control software to replace the earlier and much-maligned Sync with MyFord Touch system. Underneath the tall, slightly bulbous shape of the C-Max are the underpinnings of the well-regarded Ford Focus compact hatchback and sedan. From some angles, it simply looks like a tall, more upright version of that model; from others, it's more like a wagon, with a vertical tailgate and slab sides. Up front, a version of the large trapezoidal grille now used throughout much of the Ford lineup marks it as a member of that family. Along the sides, accent lines and window angles give it more of a small minivan appearance. Inside, there's a lot of sporty charm. The C-Max's rich, stylish dash and soft-touch materials will appeal to buyers in a way that the sea-of-plastic dash and incoherent instruments in the last Prius simply couldn't. A 2.0-liter inline-4 and hybrid system with two electric motors gives 195 combined horsepower—which is a whopping 54 hp more than that of the last Prius powertrain. The Ford is several hundred pounds heavier, but that added power translates to a driving feel that's much perkier and less stressed than the higher-efficiency Toyota. As for the plug-in version, the C-Max Energi offers a very useful all-electric driving range of 20 miles, thanks to its larger 7.6-kwh battery—versus 1.4-kwh in the standard C-Max hybrid. As for fuel economy, the C-Max has a somewhat smudged record. The conventional C-Max Hybrid is rated at 42 mpg city, 37 highway, 40 combined, but that figure was arrived at following two separate reductions in the original ratings (which had started at an unbelievable 47 mpg, which no owner came close to). 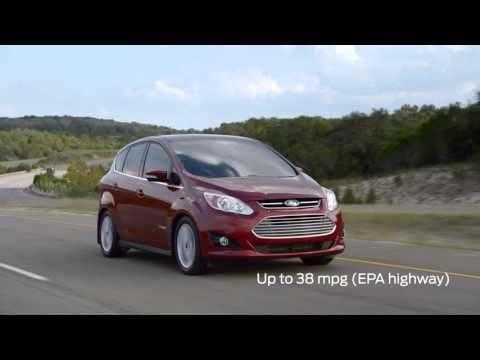 The C-Max Energi was also reduced; it is now rated at 38 mpg combined, with 20 miles of all-electric range. The whole affair was a major blunder and PR faux pas for Ford, but the ratings now reflect what mileage owners are likely to get in the real world. On the road, it's hard to find fault in how the Ford C-Max drives—especially if the last-generation Toyota Prius is your benchmark. The C-Max is far less stressed and noisy under maximum power, at the cost of fuel efficiency that's about 20 percent lower. Our only real disappointment was that the C-Max just didn't have the tight, lithe feel of the Focus hatchback. Given that it's 650 pounds heavier than a Focus five-door, that's not surprising—but you can feel it on the road, where a suitably stout suspension and a firm ride allows occasional road-surface imperfections to come directly through to passengers. The C-Max offers lots of interior room, with both models comfortable and spacious for their size, perfectly capable of hauling around four adults and their luggage. There's plenty of headroom and legroom front and rear, though he back seats are a bit on the low side, leaving anyone adult-sized in a knees-up position. Ride quality is firm but just agreeable enough, active noise cancellation and lots of sound-insulation measures help keep on-the-road refinement at its best. 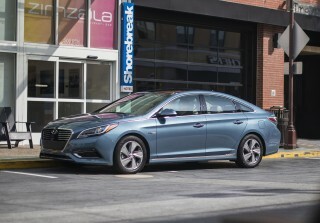 The Energi plug-in hybrid model loses significant load-bay space to its larger battery pack, a compromise some potential family buyers may not find acceptable: What would be a flat cargo floor turns into a compromised, multi-level affair that seems flawed if you flip forward the rear seat backs. The IIHS gives the C-Max mostly good scores in its testing, however the lack of any forward-crash prevention systems keeps it from the agency's top awards. It gets a four-star overall rating from the NHTSA, with four stars for frontal crash and roof strength but five for side impact. It has seven airbags, including a driver's knee bag, and the usual range of now-standard safety equipment. A backup camera is also standard. At the base SE level, the Ford C-Max includes standard 17-inch aluminum alloy wheels, a six-speaker AM/FM/CD/MP3 audio system with USB and auxiliary input jacks, an illuminated glove box, keyless entry, dual-zone automatic climate control, rear-seat heater vents, the Sync voice-controls system, and the SmartGauge digital display system with InfoGuide screens that let the driver configure information on the car's operation and energy consumption. Lots of option packages and a la carte options include items such as heated side mirrors, a power liftgate, MyFord Touch, and a Parking Technology package. The 2016 Ford C-Max is an upright hatchback with the usual Ford front, but its interior is stylish and upmarket. Whether you view it as a tall wagon, a hatchback, or even a minivan that happens to have hinged rear doors, the 2016 Ford C-Max is designed as a small, but practical family hauler. In Europe, these are mainstream family cars, and the car's utilitarian lines reflect that. It's somewhere between the ultra-aerodynamic (and all-new) Toyota Prius liftback and the taller, more capacious Prius V wagon in both size and shape—though it's got a far nicer interior than either one. The front end has a trapezoidal grille, with a snub nose, an arched roofline, and a high beltline leading to a somewhat pert tail. With relatively small wheels and tires in large, highlighted wheel arches, the C-Max can look bulbous and thick from some angles. It's definitely not as sporty as the Focus hatchback, whose underpinnings it uses with a less racy body but much higher fuel efficiency. In the U.S., the C-Max is solely a hybrid, just as there's no non-hybrid Prius, so it's distinctive in that regard. Still, it doesn't scream "oddball styling," which many buyers will like. Inside, the dashboard is rich and stylish (similar to that of the Focus), and soft-touch surfaces plus modest touches of brightwork give the C-Max a much more premium look and feel than you'd expect from anything with such high gas mileage. It's much more upscale in look and feel than the hard-plastic interior of the outgoing Toyota Prius, and even the nicer but still odd interior of the brand-new Prius. The full-color displays can be configured to show the information drivers want, and the upholstery and surfaces are simply nicer than most highly efficient compact cars. The 2016 Ford C-Max is more fun to drive than the outgoing Toyota Prius, but it's still no rocketship. The 2016 Ford C-Max is a fairly responsive full hybrid that allows you to travel at lower speeds solely on electricity, and otherwise uses its electric motor and recaptured energy that would otherwise have gone to waste to assist the engine. 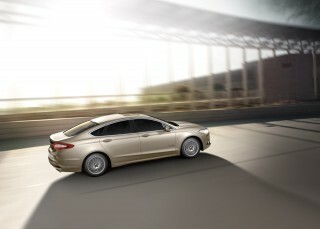 That gives it much higher gas mileage figures than its lighter, smaller compact sibling under the skin, the Ford Focus. If you get the version with a plug (the C-Max Energi plug-in hybrid), you get more all-electric capability up to higher speeds, and 20 miles of theoretical electric range before the engine switches on. The C-Max powertrain delivers 195 horsepower, or 54 hp more than the last-generation Toyota Prius. Its 2.0-liter inline-4 and electric motor together are far perkier and less stressed than than any Prius, although the C-Max is considerably heavier. It will easily move along in electric-only mode up to 62 mph, Ford says, as long as you don't floor it. Then the gasoline engine will fire up and blend seamlessly with the electric power as the car gathers speed or the driver accelerates harder. As soon as you lift off, the C-Max can recover as much energy as it can while braking or coasting, and Ford's blending of electric and friction braking—a hard thing to do smoothly—is all but imperceptible. Reducing engine noise and harshness were a priority for Ford, and the higher power means that the C-Max simply doesn't struggle under heavy loads as a Prius does. The noise suppression is also good, meaning the engine note is less desperate and shrill under full power. And that offers drivers more confidence in tight or steep situations. The C-Max incorporates hill descent control to help stay safe down slippery driveways, and an "L" mode offers drivers stronger regenerative braking if they want it, just like a "Low" gear on a regular car. The 1.4-kilowatt-hour lithium-ion battery pack of the C-Max Hybrid is positioned under the load floor just behind the rear seat. The plug-in hybrid C-Max Energi, however, has a much larger 7.6-kwh battery that also sits under the load floor. (You'll sacrifice some cargo space as a result.) Its official all-electric driving range is 20 miles, slightly higher than the handful of plug-in hybrids available so far. That's enough for an electric commute, with the benefits of a gasoline vehicle for weekend trips. We've found the C-Max Energi to deliver remarkably close to this in real-world driving, so it's perfect for even medium-distance commuters to drive to work, recharge the car there during their workday, and then drive home—all on electricity. It's hard to fault how the C-Max models drive. Their steering is precise and well-weighted, though not quite good as that in the Ford Focus, but certainly better than what you'll find in other small crossovers. A hefty curb weight of almost 3,700 pounds in base form and 200 more in the plug-in Energi adds up to handling that isn't as "compact car" as you might expect—it's more on the solid, larger-car end of the scale. Still, it offers far more road feel and driving enjoyment than most other vehicles you'd consider to be rivals. The 2016 Ford C-Max is comfortable and quiet, with enough space for four adults and luggage in a compact footprint. The 2016 Ford C-Max may have the footprint of a compact car, but it's remarkably spacious and practical inside. It makes a very good vehicle for four adults, and it offers decent cargo space (at least in its standard Hybrid version) along with an impressive ability to reconfigure the space for multiple uses. It's the equivalent in Europe of the much larger minivans we buy in the States, and for those who don't need or want something that big or three rows of seats, it's a sensible choice. The front seats are comfortable and feel lushly padded, with more than enough space for adults 6 feet tall or taller. You get pale synthetic (recycled) upholstery in the base SE mode, or you can move up to plush leather seating surfaces on the SEL. Surprisingly, the rear seat is comfortable too—much more so than in many compact crossover utility vehicles—and a single lever lets you fold and lower it. The height of the C-Max makes it easy to enter and exit, though the rear seat does put longer-legged riders in a slightly knees-up position. Leg room and head room in the rear, again, is fine for adults. With the seats down, the C-Max Hybrid offers 52 cubic feet of load space (out of a total interior volume of 99.7 cubic feet). Another third of a cubic foot would have categorized the C-Max as a mid-size vehicle. Put the rear seat up, and you'll have cargo volume of 25 cubic feet. Those numbers are lower than the Prius V wagon, which has 34 to 40 cubic feet with the sliding rear seat up, and 67 cubic feet when it's down. So far, we don't have comparable numbers for the all-new Prius Liftback. More practical, family-friendly features include grocery-bag hooks, a storage net, and a 110-volt outlet in the rear compartment load bay. Rear passengers even have small storage bins under their feet. Two oddities are that the load-bay floor is higher than the bottom of the tailgate—though it makes loading easy—and in the Energi plug-in hybrid model, that floor is considerably higher due to the larger battery pack underneath it. The reduced cargo space is one of the few knocks on the C-Max Energi, since flipping the rear seat back forward gives you a multi-level load bay that seems both odd and challenging to use. Still, it's the refinement in motion that really distinguishes the C-Max, though. It offers firm but agreeable ride quality, plus active noise cancellation and lots of sound-insulation to keep road and engine noise down. You may be hard-pressed to find a compact vehicle that's this smooth and capacious while delivering anything like the C-Max's fuel economy. The 2016 Ford C-Max, now in its fourth model year, gets decent ratings but lacks advanced electronic safety systems. The 2016 Ford C-Max earns good crash-test scores, if not in the very top echelon, and offers a reasonably good safety-feature set. But it's now lacking the advanced electronic safety features that are fast proliferating through even compact cars. The IIHS gave the C-Max the top rating of "Good" for all tests except the new and tougher small-overlap front crash, where it got a second-best "Acceptable" rating. Federal safety officials give the 2016 C-Max four stars out of five overall, with four stars for frontal crash and rollover, and five stars for side impact. It also notes that a rearview camera is a standard feature. The C-Max features also the usual electronic safety systems—including stability control, traction control, and anti-lock brakes with emergency brake assist. It has seven airbags: front and side airbags for each front-seat occupant, as well as side air-curtain bags for first- and second-row occupants, and a driver's knee airbag. Standard features and options on the 2016 Ford C-Max belie its frugal nature; it's far from an old-style "economy car." As in previous years, the 2016 Ford C-Max comes in a pair of trim levels: the base SE or the high-level SEL. Both the regular Hybrid and the plug-in Energi start well-equipped and approach the level of a premium brand's compact offering at the top of the scale. Standard equipment on every C-Max Hybrid includes standard 17-inch aluminum alloy wheels, keyless entry, dual-zone automatic climate control, a six-speaker AM/FM/CD/MP3 audio system with USB and auxiliary input jacks, an illuminated glove box, rear-seat heater vents, the Sync voice-controls system, and a SmartGauge digital display system with InfoGuide screens that offer the driver the ability to show only desired information on the car's energy consumption and operations. The SEL version adds Sync 3 (which replaces the unloved MyFord Touch system), heated and leather-trimmed front seats, keyless ignition with proximity sensing, rain-sensing wipers, a reversing proximity warning system, and ambient LED interior lighting. Options include both commonly-ordered packages and individual items. A Winter package bundles heated power mirrors with side indicators, and puddle lamps, and the Power Liftgate is grouped with the Rear Park Assist system. There's also a package that bundles Sync Services, the voice-control system, and Sirius XM satellite radio. The tech-heavy Hands-Free Technology package includes the hands-free liftgate operation—triggered by a kicking motion below the bumper—and a Parking Technology package will automatically steer the C-Max into a parallel parking space. The Sync 3 system, power liftgate, and heated side mirrors are also available on an individual basis. We've tested Sync 3 on other Ford models and found it to be better than the MyFord Touch system, but not without its faults. While the interface is surely sharper and slicker, it still lags in places and seemed confused in deciding between day/night display modes during dawn and dusk. The 2016 Ford C-Max is past a pair of downward adjustments to mileage; real-world numbers come in around 38 or 40 mpg. The 2016 Ford C-Max will—according to Ford—be viewed as a fun, sensible car that happens to get high gas mileage. After not one but two downward adjustments to its EPA ratings, it's no longer being positioned directly as Ford's answer to the Toyota Prius hybrid. 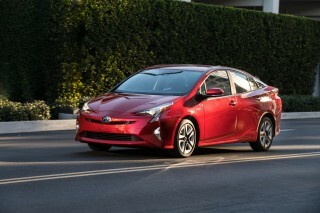 That's probably sensible since this year's all-new Prius earns a 55-mpg rating in the most efficient model. Two years ago, when the Prius was at 50 mpg combined, the C-Max was rated at 47 mpg combined. But most owners got nowhere near that figure, and complaints piled up. Ford cut the ratings on the 2013 C-Max Hybrid to 43 mpg and made payments to C-Max owners who'd bought before the adjustment, to compensate them for the extra fuel they had to buy. But then, Ford had to cut the ratings on the hybrid C-Max again midway through the 2014 model year—along with those of the C-Max Energi plug-in hybrid and four other models to boot. The ratings now sit at 42 mpg city, 37 highway, 40 combined for the C-Max Hybrid, and 38 mpg combined for the C-Max Energi plug-in hybrid, which also saw its all-electric range and efficiency numbers cut. Those now stand at 20 miles of range and 88 MPGe, or Miles Per Gallon Equivalent—the distance a car can travel electrically on the amount of energy contained in a single gallon of gasoline. The 38-mpg rating for the C-Max Hybrid correlates much more closely to what we've seen on test drives. City and suburban driving may return figures in the low 40s, falling to mid- to high 30s on higher-speed highway trips. Ford fits a set of displays called Eco Coach as standard, oriented toward helping drivers understand the power flow of the powertrain and optimize their use of electric power, gasoline, and regenerative braking—as well as charging for the plug-in Energi. It's not a priusv competitor it's much too small. The s max is though.